This was it. Time for the final push. In the morning I checked the slack on my chain, and it was a it too loose for my taste. I redid it exactly to factory specification, and hoped it would remain to be alright. I had asked Björn-Erik if there were any shops in the area that sold chain spray. He went a bit further than that - he went downstairs, and came back up with a can of Castrol spray; the exact same stuff I was carrying. Apparently, he'd gotten it from a guest at some point, and I could take it along if I wanted. Totally awesome, and befitting the terrific time I had in Alta. After saying my thanks and goodbyes, I was on my way. Time for the last leg North. Speaking of legs - the chain really did seem to be running on its last ones. There was now a faint knocking noise of sorts, which hinted at part of the chain being stretched, jerking the rest as it passed by the sprockets. ...I could finally get going. As you can see I had switched back to the summer gloves again. With the nice temperatures in Skibotn and Alta, it was time for the leather ones. The vegetation meanwhile, thought it best to disappear. I found myself truly and unequivocally in the middle of nowhere. Ever since the barren sight of the place where I crossed the Arctic circle had I not felt the sensation of riding towards the end of the world again, until now. As strange as it may seem, these are the moments that I feel most at home. There's nothing and no-one for miles and miles around me, nothing but me and my motorbike. It's the same feeling I had when I was converging upon Cape Tenaron in 2013, though right now I was still more than 200 km away from my final destination. I kept on checking the chain as I was going along, to look for any whipping of sorts. The faint knock was still there at slow speeds. ...I pulled into the petrolstation at that particular juncture, and set to work to solve the problem of the knocking noise. I basically took off all the gear, and slackened the chain a bit to see if it would help. After two quarter turns back, the knock was gone. By this point, I was regretting my decision of not renewing the chain and sprockets before departure. It already had 25K on it when I left, but as 40K is an attainable figure with most chains I left it on there. I was now on the final leg of the final leg, starting at the A on the above map. After getting all the gear back on and brimming the tank, I set off. Still a bit worried, I looked for any further whipping. The chain looked a bit better off now it had been slackened. The weather and scenery saw fit to grace me with a few more beautiful gifts. The road itself was quite entertaining too. It kept following the fjords, so the turns were good leaning territory. ...it was time for something quite unsettling on this leg. The thing with the tunnels in this part of the world is that, above all else, they're cold. Outside it can be a modest 18 degrees (which still is leather-glove territory), whilst a tunnel could probably serve well as an impromptu refrigerator. Not too strange then that upon leaving a tunnel, everything fogged up immediately. Before we can talk about that though, first some more gratuitous roadworks. The miles kept tumbling at an insane rate. I just gunned it from here on in... I was getting tantalizingly close now. In the mean time, there will still reindeer on the road. Quite exceptional, this far North. And then, it was time for the final 13 kilometres. How appropriate! I pulled over, and let the camera roll. To my own amazement, it wasn't as freely accessible as I thought. As you can see in the above vid, the road ends at a line of booths, where you have to pay an admission fee to enter the Nordkapp. For me, who wanted to do without a visit to the cinema or any other nonsense, it was 160 NOK. After paying, I drove onto the parking lot, which was a huge gravel clearing. I then parked up, and continued on foot towards the big steel sphere at the very tip. As you might notice, there wasn't even a breeze. I was as far North as I could go, but there was no wind at all. It felt quite amazing being here after 13 days of riding. Part 1 accomplished. One more to go now, brother. 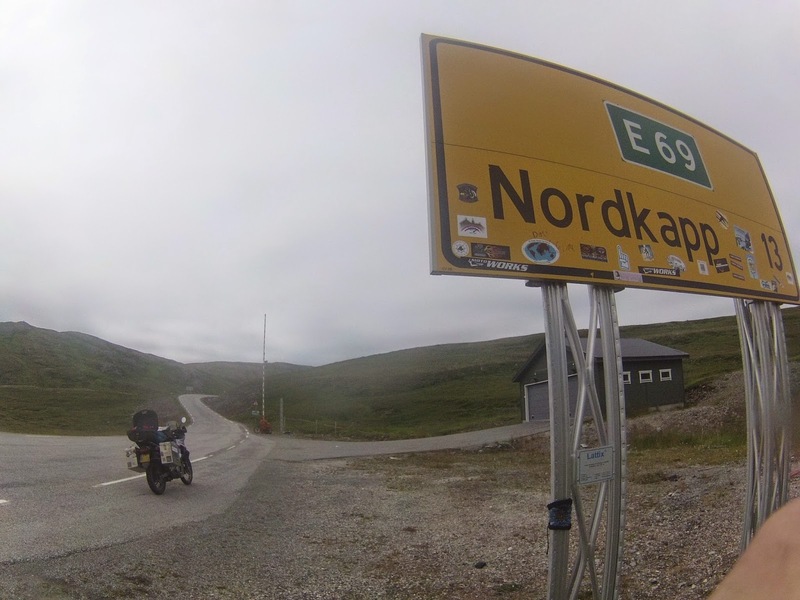 After getting a Nordkapp sticker for the panniers, I wanted to get out of there again. It was a nice accomplishment to have made it this far, but the touristiness of the location took a little bit away from the experience. The juncture with the E6 was a 130 kilometres away, a 130 kilometres of barren beauty for miles around you... and to then arrive at a complex which almost seemed like a theme park was a bit too much for me. The whole thing just seemed out of place. ...going back, you see the stuff you missed. It wasn't long though until I was at the thing I had been dreading ever since I'd driven through it on the way up. It's 7 kilometres long, starts with a 10% drop, and ends with a 10% climb. Combined with the freezing temperatures in it, it was probably the most terrifying tunnel I've ever ridden through... especially since the chain seemed to be on its way out. And then to believe that the cyclists ride in the same tunnel. My hat off to them. Once I made it out, everything completely fogged up... including my Pinlock visor. I had passed some camp sites on my way up, but I didn't feel like stopping for the day just yet. The riding was still really nice, the weather wasn't too bad, so I plowed on South. ...but if you look at these pictures, you'll get the idea why I didn't mind seeing them for a second time. In the mean time, I was doing a fuel challenge with The Beast. I knew filling up at that juncture with the E6 that fuel stations could perhaps be few and far between on the road towards the cape. And they were. I didn't ride past any fuel pumps on the way up. 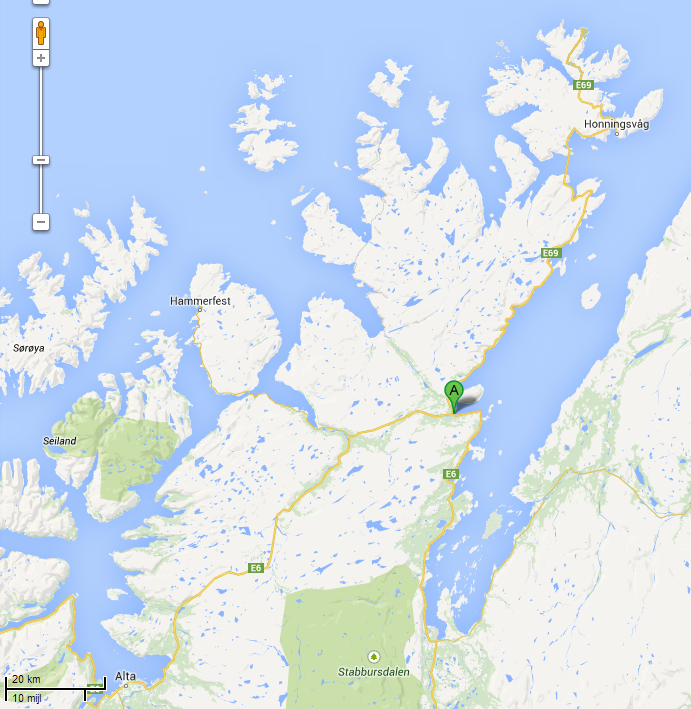 There probably was one in the city of Honningsvag, but I didn't feel like filling up just there. This presented me with a challenge - when fully-laden at 100 kph, the Beast will do 1L every 19km. This ofcourse goes up as the speed drops - in Norway, the bike had been doing about 1L per 22km. The fuel tank of the Beast has a capacity of 18L, and the reserve is about 3.5L. This in turns leaves about 14L of actual fuel to burn before I have to switch it to reserve. Therefore, I probably should be fine doing the 260km to and from the Cape from that petrol station... but nonetheless, the challenge was accepted! ..and without switching to reserve, it made it without a hitch. Having done 255km, it took 13L to brim the tank. Perfect. Tired from today's adventure, I checked in a 100 metres down the road. I struck up a conversation with a Hungarian who worked at one of the many fishfarms dotted around the coast - proud as he was, he gave me a sticker from his son's bike shop to put on my panniers. I then got all my stuff inside, and then it was time to get cracking with editing the footage for the trip compilation (which is done now by the way... but you'll have to wait a little longer to see it, muwaahahaaaa!). The next morning, the sun was nowhere to be seen. It was quite miserable. I must say that by this point, I just wanted to get out of Norway. The experience had been tremendous surely, but after 9 days of gunning down fjords, camper vans and expensive fuel, I felt ready for a new experience of sorts. I wasn't aware though that Norway still had one parting present waiting for me, close to the border with Finland... but more on that later. Right now, it was time to head on further South. I must say though that once I was on the move, I felt better already. I just took it on myself to have frequent breaks, to spread my energy through the day. With the first break after just 60 km, things had brightened up considerably. The city of Karasjok. It's well known for its large Sami community, so I decided to stop by at the Sami museum. It was quite extraordinary to see the skill and craftsmanship involved in the Sami culture. Just by looking at how a typical Sami tent is built up you get the sense of the ingenuity they have. All poles are cut to shape, and strung together they make up an intricate skeleton that keeps them warm when temperatures are well below zero. What completely did it for me however was the parting present Norway had been saving till the final stop on my Norwegian tour. Say hello to Maret, a 100% Sami herself. 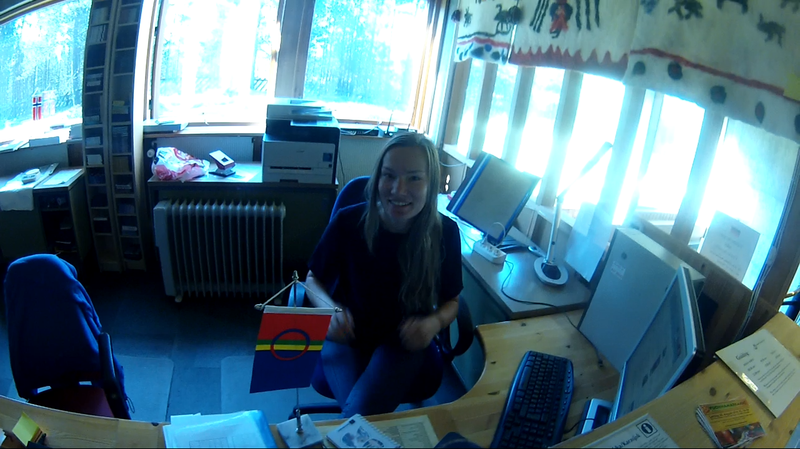 I talked to her about the Sami history and repression, and soon enough she asked me where I was from. Upon me telling her about the trip she confessed she also wanted to travel by herself, but it was a bit more dangerous as a woman... especially since she wanted to visit Latin America someday. If all Sami women are like this, screw it, I'm moving. 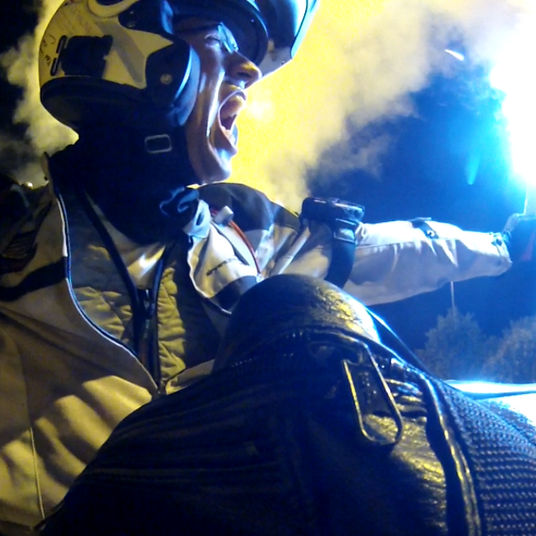 I wished her the best of luck, and soon after Karasjok, I converged upon the Finnish border. Tusen takk Norge, it was a downright beautiful visit in every way. Time for a new country! I knew up front that the first miles into Finland would be of the dead-straight variety, but after being in fjords for over a week, this was a welcome change. It gave me the chance to zone out a little. Norway was adamant that I'd not forget about her though. What struck me first of all was the abundance of little souvenir shops along the road. I guess the Finnish are well aware these are tourist roads. I didn't find a suitable Finland sticker here though - the only one present was one of just the Finnish flag, which had the size of two postage stamps. I bought it anyhow and stuck it in my wallet. Should there not be any proper stickers in the coming days, I could still take it out. On the road south I learned that this was what most of the Finnish countryside is about. Trees, and lakes. ...one of the coolest stickers I've ever had the pleasure of putting on the panniers. I like these non-standard, coat-of-armsy decals...makes me think why there are so many other countries that stick with the boring white ovals. 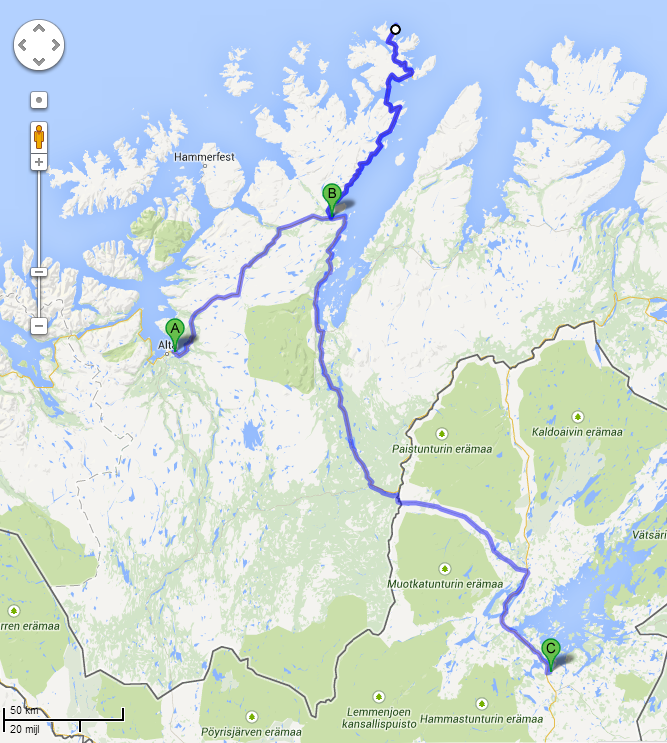 Not too long after, I pulled into the first Finnish halt of this tour, just 10 kms North of Ivalo. As it turned out the camp site was run by a Dutch couple, who had moved to Finland a few decades ago. I knew it was right beside a lake, so I was hoping to get some more swimming action in while I was at it. Time to camp amongst the trees. Doesn't happen all too often I get to camp in a forest. And ofcourse, there was swimming to be done. It wasn't as cold as the river dive, thankfully... making for quite a relaxed dip after all. I had planned to be at the Cape at the thirteenth day, but because I hadn't stayed at the Cape itself and Finland had some nice straight roads, I was now once again ahead of schedule. I didn't know what to expect of the Finnish people though, but the Dutch proprietor of the camp site gave me an insight in the local history. He'd seen the flag I flew at my camp, and wondered where it was from. He then continued by saying that officially in Finland, it is illegal by law to fly the flag of another country without the Finnish flag present. If you must fly another flag, the Finnish flag should be flown too, and never hang below the other flag - either it is at the same level, or it flies above the other flag. The simple reason for this is that Finland is a young country, taking great pride in their nation and with it, their flag. I then told him of the stories Björn-Erik had told me about the Nazi occupation (and subsequent destruction) in Norway. This rang true for Finland too, because apparently just like Alta, the Nazis burned down everything in Northern Finland as well once they had to retreat out of the country. This in turn was the source of a typical Finnish saying, that you should "never give matches to Germans". He told me that whenever there were Germans staying at his camp site, a Finnish person could walk over to tell him (in Finnish ofcourse) to 'not give them any matches'. I liked this type of black humour... and in the coming days, I was to experience exactly how humorous (and hospitable) the Fins can be.